Memorizing English names for basic objects is needed by students or anyone who starts learning English. English by Picture is designed as a basic application to help beginners or students learn basic English in an interactive way. 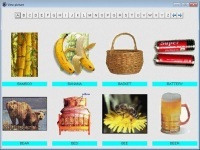 The main purposes of this basic game is to help memorize the name of everyday objects. The techniques used are by guessing a correct picture or a correct name based on the description provided. All objects are basic object in everyday life. So, if you just learn English, this game is a good choice to improve your vocabulary.